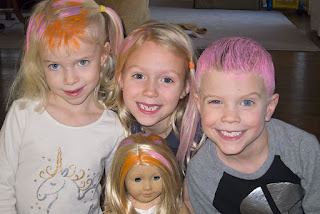 Mia gave CC some old hair chalk, and CC went nuts with it one morning. She colored her ponytail purple, and strips of her hair on the side and the back orange and pink. She entirely colored Little Man's head pink, and Sweet Pea's a mix of orange and pink. Even Catherine got the hair color treatment.